War crimes probe -"‘If President, PM oppose foreign judges, who co-sponsored Geneva resolution?" 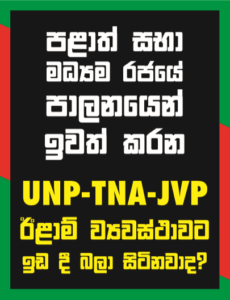 The Joint Opposition (JO) has sought an urgent explanation from the government in respect of Geneva Resolution 30/1 in the wake of both President Maithripala Sirisena and Premier Ranil Wickremesinghe ruling out foreign judges’ participation in the proposed judicial process. The 47-member United Nations Human Rights Council adopted Resolution 30/1 on Oct 1, 2015. Addressing the media at Dr N. M. Perera Centre in Borella yesterday, former External Affairs Minister Prof. G.L. Peiris said the government’s position was certainly comical as the Geneva Resolution 30/1 was co-sponsored by the yahapalana administration and it specifically dealt with a robust foreign participation in the process. Prof. Peiris pointed out what he called the absurdity of yahapalana leaders trying to dissociate itself from a resolution that had been co-sponsored on the instructions issued from Colombo in Oct 2015. The former minister said the government was left with egg on its face having bended backwards to appease those pursuing unsubstantiated allegations against the country. Denying that the Sri Lankan military had one anything wrong, prof. Peiris said the armed forces couldn’t be faulted for saving over 300,000 LTTE held hostages at risk to their own lives. Prof. Peiris said that as the military had followed standard international practices during operations against the LTTE, a foreign-led probe wasn’t needed. When The Island pointed out that even the Lessons Learnt and Reconciliation Commission (LLRC) as well as report on the Second Mandate of the Presidential Commission of Inquiry Into Complaints of Abductions and Disappearances, aka the Paranagama Commission acknowledged the need for investigating specific allegations and accepting foreign expertise, Prof. Peiris reiterated that the previous government’s response had been different to that of the incumbent administration. Prof. Peiris said that the Panel of Experts (PoE) contained unsubstantiated allegations. Asked why the previous government had ignored an invitation to make representations to the PoE, Prof. Peiris said that it was a political project. Alleging that they had been on an agenda against Sri Lanka, Prof. Peiris said that whatever representations, they would have still put out a report inimical to Sri Lanka. He alleged that Manouri Muttetuwegama’s Consultation Task Force for Reconciliation Mechanism (CTFRM) had been based at the Presidential Secretariat. The CTFRM had recommended foreign judge each in proposed war crimes court, prof. Peiris pointed out. The former External Affairs Minister said that in fact the CTFRM had endorsed co-sponsored Geneva Resolution.